In the last several years there has been a build up of sentiment that the oil/gas pipeline which essentially serves Canada, is dangerous enough to warrant discontinuing service. Never mind the fact that road and rail transport of such commodities would necessarily pick up the slack. Comparisons have even been made multiple times, with pipeline service showing itself to be historically safer. Of course, Enbridge has had a problem in the past. It’s past safety practices have not inspired confidence. 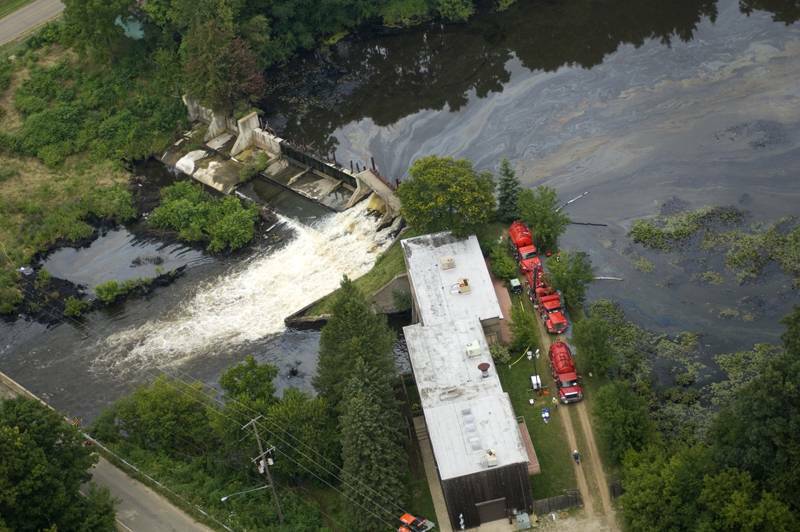 The picture to the right shows the result of the result of a burst pipeline in a tributary of the Kalamazoo river. Fortunately there was a dam in place, and the material effect was relatively limited though still a disaster by any standard, requiring a couple years of clean up. But this particular disaster has prompted many suggested changes in the way these pipes are handled and maintained. Hardened regulatory regimens are not at all inappropriate under these circumstances. Who could argue against them? Schuette (the diplomat enforcer) had already made sure that no heavy crude would sail those waters. No doubt that Bill Schuette, in the midst of his other numerous duties as Michigan’s Attorney General, has completely researched the issue, and has ignored the political scales in search of the truth, the whole truth and nothing but the truth. Locks repairs, new bridge to Canada--Tunnels--is this the infrastructure everyone's talking about? Just this week I attended a meeting which involved Line 5 discussions. There were some very smart people there. Line 5 transports three types of fuel to the folks in the UP, something I did not know. If folks knew how many of these under ground lines, beneath lakes and rivers criss-crossing this state. . .There is no safer alternative to line 5. When are we gonna learn--if it ain't broke don't fix it. What was he thinking????? "...Never mind the fact that road and rail transport of such commodities would necessarily pick up the slack. Comparisons have even been made multiple times, with pipeline service showing itself to be historically safer...."
The Lac-Mégantic rail disaster occurred in the town of Lac-Mégantic, in the Eastern Townships of the Canadian province of Quebec, at approximately 01:15 EDT, on July 6, 2013, when an unattended 74-car freight train carrying Bakken Formation crude oil rolled down a 1.2% grade from Nantes and derailed downtown, resulting in the fire and explosion of multiple tank cars. More than 30 buildings in the town's centre, roughly half of the downtown area, were destroyed, and all but three of the thirty-nine remaining downtown buildings are to be demolished due to petroleum contamination of the townsite Initial newspaper reports described a 1-kilometre (0.6 mi) blast radius.